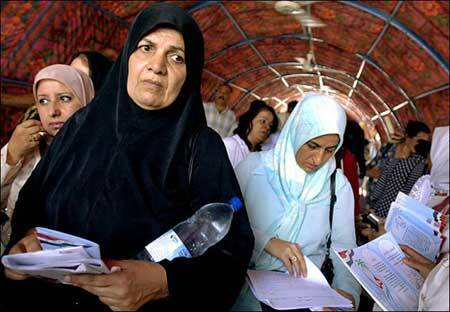 Women’s groups protested in Baghdad July 19 against draft constitution imposing sharia (Islamic law) on Iraqi women. Following the colonial elections at gunpoint last January, the “celebration of democracy” was short-lived. The vast majority of Sunni Arabs boycotted the charade, knowing that it was designed to marginalize them in a regime dominated by clerical politicians of the Shiite branch of Islam. Soon the Shiite bourgeois politicians and their temporary allies among the Kurdish parties fell into squabbling over posts and control of oil revenues, barely managing to appoint a “cabinet” and “prime minister” who lack any credibility. The real power in Baghdad is the U.S. military and American proconsul Zalmay Khalilzad. This time around, a number of Sunni bourgeois parties and religious figures are calling to vote “no” in the referendum. They evidently want to show the numerical strength of the Sunni population, which the Western press generally puts at 20 percent of Iraqis but is considerably larger, since their chances of actually defeating the constitution in the rigged voting are slim. Under the complicated rules, two-thirds of voters in three provinces have to vote against the charter to block it. Clearly, these Sunni sheiks, clerics and bourgeois nationalist supporters of the former Baath regime of Saddam Hussein do not rule out participating in the political circuses set up by the imperialists. Various resistance groups that have bedeviled the occupation army with a tenacious insurgency in the Sunni regions have said they will call a truce to enable participation. These bourgeois forces only seek a better deal with the imperialist occupiers. Even the most reactionary jihadis (holy warriors) recall how in the 1980s the U.S. bankrolled and armed mujahedin cutthroats fighting Soviet forces and a secular-nationalist petty-bourgeois government in Afghanistan that taught young girls to read and write. Revolutionary Marxists, defenders of Leon Trotsky’s program of permanent revolution, oppose imperialism down the line and hailed the Soviet Red Army in Afghanistan. In Iraq today, the Trotskyists greet every blow struck against the colonial occupiers who are laying waste to the country and sadistically subjecting the Iraqi population to a hell of torture and poverty. The League for the Fourth International is for active boycott of the colonial referendum, which no matter what the provisions of the phony constitution are, will only serve as a “democratic” mask for the bloody rule of U.S. guns, and for driving the U.S. imperialists out of Iraq. Spokesmen for the Bush regime tried to distance themselves from the constitution when Iraqi women protested last July that it was imposing sharia (Islamic law) to cover matters of family and personal status. This would deprive women of rights won in the 1958 aborted revolution that overthrew the British-backed monarchy. Although this was later disguised by saying that laws will accord “personal status according to their own religion,” this means that Islamic law will apply to Muslim women (the vast majority). While Bush & Co. cynically claimed that freeing women from oppression by the Taliban Islamic fundamentalists (whom Washington had earlier aided) was a goal of the U.S. invasion of Afghanistan, women there are still imprisoned in the head-to-toe shroud of the burka, making them faceless beings. And in Iraq the Bush regime is imposing a constitution formalizing the subjugation of women. The Iraqi constitution also prepares the way to the break-up of the country, including provisions for autonomous regions with their own armed forces. This will mean that as the U.S. reduces the numbers of its occupation troops, as the Pentagon plans to do in a few months, the Kurdish pesh merga militias and Shiite armed groups such as the Iranian-supported Badr Brigade will locally control the oil-rich northern and southern regions, while Sunnis in the resource-poor central region will remain under the boot of the imperialist occupiers. This prospect has enraged Iraqi Sunnis, and has unnerved Sunni regimes in neighboring countries, notably Saudi Arabia. As proletarian internationalists, Trotskyists fight against all forms of national and ethnic oppression, and we have no commitment to maintaining the borders of neocolonial regimes which were arbitrarily determined by the colonial rulers. These regimes typically repress a multitude of ethnic and national minorities (or even majorities). We have long called for a united socialist Kurdish republic, to bring together that people carved up among various capitalist countries in the Treaty of Sèvres following World War I. We have noted that Iraqi Shiites were among the most determined fighters against British colonial rule. But when the various Kurdish and Shiite leaders become puppets of Washington in its war on and colonial occupation of Iraq, their talk of national and democratic rights becomes a screen to hide imperialist rule. While defending the rights of all national/ethnic communities (including Turkomans, Assyrian Christians and others), communists fight for the defeat of the real power in Iraq, the U.S. occupiers. At the same time, we defend the Kurds in Turkey, Iran and Syria against their bourgeois nationalist oppressors, as well as the Shiite majorities in eastern Saudi Arabia and Gulf oil sheikdoms, where they form a large part of the strategic oil workforce. Some defenders of continued occupation of Iraq argue that, whether or not the 2003 invasion was justified, for the U.S. to pull out now would guarantee a sectarian civil war due to age-old animosities between Sunnis and Shiites. In fact, the U.S. has greatly exaggerated traditional hostility between the various ethnic/religious communities in Iraq, and has consciously sought to exacerbate such divisions following the precept of divide et impera (divide and rule), the traditional formula for imperial rule from the Roman Empire to the British raj in India. In fact, Iraqi Shiites made up a large portion of the soldiers who fought under Saddam Hussein against the Iranian Shiite armies of Ayatollah Khomeini during the decade-long Iran-Iraq war of the 1980s (in which Washington played both sides off against each other, supplying chemical weapons to both). Particularly before the Shiite uprising of 1991 (which George Bush I encouraged in the wake of the Gulf War, only to then abandon the hapless insurgents), there were significant numbers of secular Shiites in Hussein’s Baath party, including many middle-class professionals. They are now being hunted down and murdered by the Shiite clericalists. U.S. imperialism has consciously sought to establish a Shiite ascendancy in Iraq from the outset, beginning with its alliance with the CIA/Mossad-linked swindler Ahmed Chalabi, a favorite of the “neo-conservative” warmongers in Washington. Now the Bush II government is reaping the fruits of its strategic policy. It organized bogus elections designed to minimize Sunni Arab representation, now it is ramming through a fake constitution to lock in Sunni subordination. As Kurdish and Shiites mini-states emerge, even Iraq war “hawks” have a sense of “foreboding” and “alarm” over the outcome, the Financial Times (12 October) reports. At a conference on Iraq at the conservative American Enterprise Institute, Iraqi intellectual Kanan Makiya, one of the biggest propagandists for U.S. intervention to overthrow Hussein, called the constitution a “profoundly destabilizing document” that could “deal a death blow to Iraq.” At the same conference, Phebe Marr, formerly of the Institute of Strategic Studies of the National Defense University, said that with an Iraqi Kurdistan in the north and a de facto “Shiastan” in the south, the result would be an “arc of instability in the Sunni center” leading to the eventual dissolution of Iraq. If it happens, it will be a direct result of U.S. policy. In a televised address aimed at boosting sagging morale on the “home front” and his own plummeting ratings in the polls, George Bush II appealed for support to “stay the course” in Iraq. Despite his ranting about “Islamo-fascism” and attempts to paint the secular Baathist regime in Syria, which slaughtered 10,000 Muslim fundamentalists, and the Shiite theocracy in Iran as allies of the Wahabi and Safiyist Sunnis of “Al Qaeda” (who consider Shiites to be apostates), Bush’s appeal for a crusade against Islamic fundamentalism fell flat. Support for the Iraq war is down to 32 percent in the latest CBS opinion survey, with 59 percent favoring withdrawal ASAP, whatever the consequences. We have noted before (see “Drive U.S. Imperialists Out of Iraq!” The Internationalist No. 21, Summer 2005) the growing defeatist sentiment among large sections of the imperialist bourgeoisie. It is to this sentiment that various reformists and centrists appeal when they call on the government to “bring the troops home” or for “U.S. troops out of Iraq” (so they can be sent to New Orleans and impose martial law on the black poor who survived the aftermath of Hurricane Katrina?). Orienting to the liberal imperialists, the pseudo-socialists are in effect trying to save the U.S. from a humiliating defeat.